Like its namesake characters, Jekyll & Hyde Taphouse and Grill in Matthews, North Carolina has two personalities: Jekyll is the dining room, whereas Hyde is the bar. The owner plans to open a second, larger location this summer. "Missing Link" hits the movie screens; Musical escape room in Colorado; Publisher set for Iron Harvest; A firefighter’s steampunk lamps; The latest from Frenchy and the Punk; Wizard of Oz gets steampunked. . . with zombies; and more. Photo Gallery: The producers of the Big River Steampunk Festival debuted a smaller event at the Mark Twain Brewing Co. in downtown Hannibal, Missouri. Fortunately for us, photographer Curt Knapp was there with his camera. 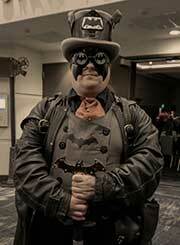 San Diego will get another dose of steampunk revelry as the Gaslight Gathering returns April 12-14. Special guests include Abney Park, The Eternal Frontier, Doc Phineas, Dyno Staats, Drake & McTrowell, and cosplayer Dude Vader. “Re-discovered” Victorian photos; News from Gail Carriger; Airship diorama seeks exhibit venues; Steampunk fashion at the Morris Museum; New steampunk brewery in Houston; Reports from Big River Steampunk Spring Faire. One attraction of any steampunk convention is the sight of attendees wearing fanciful costumes, and Clockwork Alchemy was no exception. Some of the most elegant outfits were seen in the fashion show, but that was just the beginning.